The “corridor” would bring Pak infrastructure right up to the Indian border. Over the past year, gurdwaras in Pakistan have been used for a pro-Khalistan campaign. Punjab minister Navjot Singh Sidhu has claimed that Pakistan Army chief Gen Qamar Javed Bajwa has told him that Islamabad would open a corridor to Gurdwara Darbar Sahib at Kartarpur in Pakistan’s Narowal district on the 550th birth anniversary of Guru Nanak next year. The gurdwara at Kartarpur stands at the site of the final resting place of the first Sikh Guru, just across the border from Dera Baba Nanak in Gurdaspur district. Former Union Minister M S Gill told The Indian Express that the offer was a “huge signal” that New Delhi should welcome. The gurdwara was opened to pilgrims after repairs and restoration in 1999, and Sikh jathas have been visiting the shrine regularly ever since. This was one of the outcomes of the historic bus trip to Lahore by Prime Minister Atal Bihari Vajpayee in February 1999, and there are no restrictions on visiting Gurdwara Kartarpur Sahib once a pilgrim has entered Pakistan on a valid visa. Sikh jathas from India travel to Pakistan on four occasions every year — for Baisakhi, the martyrdom day of Guru Arjan Dev, the death anniversary of Maharaja Ranjit Singh, and the birthday of Guru Nanak Dev. These Indian pilgrims are given access to all gurdwaras in Pakistan. 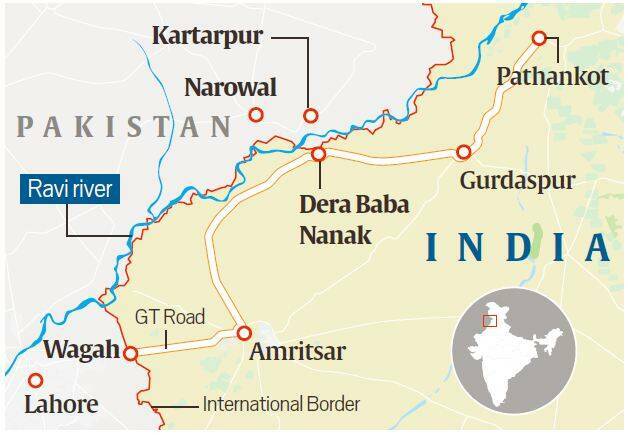 There have long been demands from the Shiromani Gurdwara Parbandhak Committee and political leaders to build a “corridor” flanked by barbed wire to allow pilgrims to cross over into Pakistan to visit the Kartarpur Sahib shrine, and return the same day. A bridge will need to be constructed over the Ravi, and there shall be no need for passports or visas. Most recently, the demand was placed before a Parliamentary Standing Committee that visited Dera Baba Nanak last year.